Do any Canadians have the Preston FR bike? And is it worth the almost 3 grand to buy or ... what can you buy cheaper that is about the same? Single track, road, jumping.... all in one. go on MTBR and find a guy named TransitionJ, he's a Canadian Transition dealer. where in canada are you? the transition bikes are great, dont look at Kona's, get somthign better that bolts dont snap on or plates dont bend. The preston Fr is a great bike, you would love it with a marz 66 on the front....cant go wrong, I ride a trail-or-park and love it!!! its a hardtail, but its awsome! And the company alone is great they will help you with any questions and if you are close enough they will let you ride one of their own bikes. maybe but JS is just a pro rider for transition...so who knows!? I'm really considering a Preston FR too. With a good build it would be nice and tight. I'm thinking end of year sale to pick up an 05, but what about the 06 line? 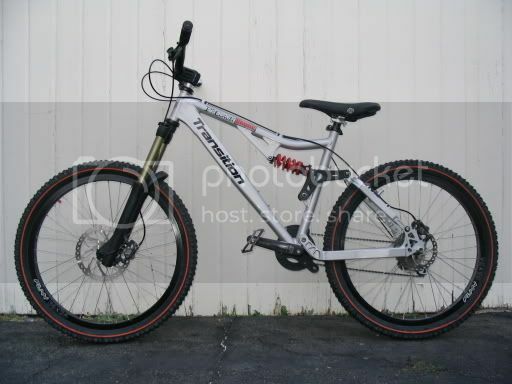 Does anyone have any info on transition bikes for 06? As far as the preston is concerned, my understanding is that the preston won't change much for 06 other than a new color--can't remember the name, but a really nice red is what it boils down to. As far as the preston, I have one, and can't say enough good things about it as an all around bike. You should seriously just call up transition (206) 353-0007 and talk to Kevin or Kyle (the owners). They are super helpful guys and are great when it comes to answering questions large and small. .....Shhhhhh---If everyone knows how good the Preston is, they'll all want one. The Preston FR is a great bike that does well wether it's at Whistler or on my local single track with just a swap of the tires. It climbs reasonably well and is able to handle quite a bit on the way down. The geometery in both the 4"& 5" setting feel right depending on what you want it set up for. I love riding this bike and as others have mentioned the customer service from either Kevin or Kyle is the best! I'm liking my Preston but I got an 04 without the Dangerboy plates. I'll be ordering them soon but the only thing that really bugs me right now is the weight. That review lists their build as 35 pounds, mines almost 45!! I've gotta swap some stuff out though, got a new front wheel to throw on. Once I get it closer to 35 it'll perfect. Only difference from the pic below is there's on 03.5 Z150 on there now.